Answer the call. Touch the big green Answer button to answer the incoming call, just like you answer any call on your phone. The call you’re on is placed on hold. Send the call directly to voicemail. Touch the big red Ignore button to send the incoming call directly to voice mail. Ignore the call. Do nothing. The call eventually goes to voicemail if you’ve set the option Forward When Unanswered. To switch callers: Touch the Switch Calls button. Every time you touch the Switch Calls button, you connect to the other caller. Lamentably, the screen doesn’t show you which call you’re on; it merely says In Call, and you have to figure out on your own whom you’re switching to when you touch the Switch Calls button. To end a call: Touch the End button, just as you normally do. It might appear as though both calls have been disconnected, but that’s not the case: In a few moments, the call you didn’t disconnect “rings” as though the person called you back. Actually, the person didn’t call you back; the Droid X is simply returning you to that ongoing conversation. The Android operating system may be updated for your Droid X in the future, in which case, handling multiple calls might work differently. 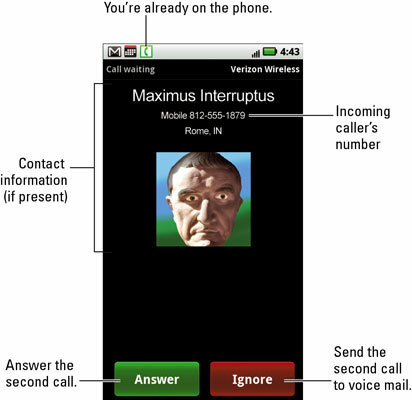 For example, a Swap button might be used to switch between multiple calls.